High-quality rock tumbler turns ordinary rocks into beautiful gemstones! There is no better way to learn about geology. 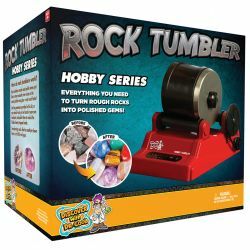 Includes noise-reducing rubber barrel with stainless steel lid, 1/2 pound of semi-precious stones, 4 grades of polishing grit, jewelry fastenings and activity guide written by teachers.